HARRISBURG, Pa. — The whirring of spinning wheels, the carding of wool and the steady clack of the loom filled the small arena of the Pennsylvania Farm Show Complex, Jan. 13. 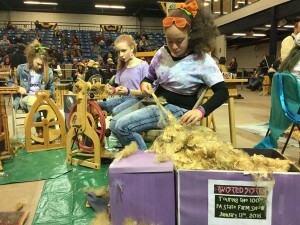 Six teams competed in the Youth Fleece to Shawl competition. The Wizards of Wool, of Adams County, Pennsylvania, was this year’s grand champion team, with their shawl themed to fit the 100th anniversary of the Pennsylvania Farm Show — farm tractors. 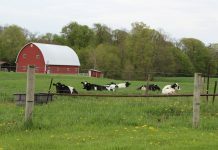 Choosing colors of red, green and gold, and blue and white, the team drew inspiration from the equipment canvassing Pennsylvania’s farmland. Team members included: Joshua Stoner, Jacob Stoner, Dorothy Marquet, Marissa Shoemaker and Cate Kidwell. 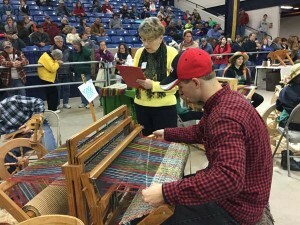 Josh Stoner of the Wizards of Wool from Adams County PA, is busy on the loom during the youth Fleece to Shawl contest. “The whole idea is to come in with a shorn fleece, have the team members spin it into yarn and then one weaver is going to be weaving it into a shawl,” said Tom Knisley of Red Stone Glenn Fiber Arts Center, York Haven, Pennsylvania, and contest coordinator. Each team is made up of five team members: a carder, three spinners and one weaver. Prior to the competition, the teams prepare their loom with the colorful threads that make up the base of their shawl. Teams bring in their pre-warped looms and their shorn fleece and get to work. A carder carefully pulls a few strands of fleece from the pile of shorn and cleaned wool and begins to card at the fibers until it is ready to be passed to the spinners. Three spinners pedal away at their spinning machines diligently preparing the wool for the weaver who rhythmically weaves the fiber into a finished shawl. 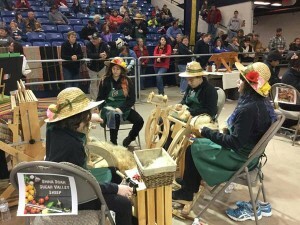 The Sugar Valley Sheep team from Clinton County, PA, work on their shawl with a gardening theme. As they are preparing their shawls, four judges make their way around to each team, looking at the quality and cleanliness of the fleece, the spinning quality and uniformity of the spinners as well as the uniformity and evenness of the weaver putting the shawl together. Judges also take into account the uniqueness of the themes. A large portion of the score comes from the design and appearance of the finished shawl. Judges look for originality in design, difficulty of the weave and color coordination in the overall appearance of the shawl. Team members have three hours to complete their shawls and bonus points are given to teams who complete their shawls the quickest. Following the competition, the judges make their picks for the award-winning shawl as well as specialty awards. Those specialty awards included: the Spinners Award and Weavers Award, both presented to The Twisted Sisters of Dauphin County; the Best Fleece Award, presented to The Wizards of Wool; and the Team Choice Award, presented to the Sugar Valley Shepherds of Clinton County. The Twisted Sisters team of Dauphin County prepares wool to be spun. Later that evening, following the adult Sheep to Shawl competition, the shawls were auctioned off, with the money going back to the teams so they can save it for next year’s competition, said Knisley. “It’s amazing. 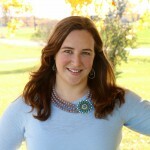 Some of these prices go anywhere from $700 to thousands of dollars,” said Knisley. The Wizards of Wool team sold its shawl for $600 and The Twisted Sisters team sold its shawl for $1,650.